The price of copper succumbed to renewed weakness on Thursday crashing through the $3.00 a pound level in New York in brisk trade with over 1.2m tonnes of September copper worth $8 billion exchanging hands by lunchtime. 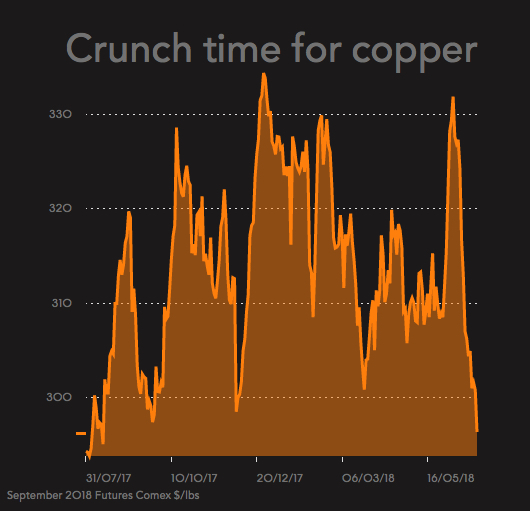 Copper touched its lowest since the beginning of October last year in morning trade at $2.9515 or $6,507 a tonne on the Comex market, down more than 11% or $770 a tonne since hitting four-year highs three weeks ago. A strong dollar and worries about the impact of a trade war between the US and China, responsible for half the world's consumption of copper and other base metals, is behind the recent pullback. Softening demand is also combining with strong supply growth this year to cloud the outlook for the orange metal. Last week, industry body ICSG estimated world copper mine production rose 7.1% or by 330,000 tonnes during the first quarter of this year. The rise was mainly thanks to higher output at the world's largest copper mine by a long stretch, Chile's Escondida, where a 44-day strike in February-March last year crippled production. However, the strike at Escondida ended without a contract and deadlines to make a deal were pushed out to the end of this month. CRU, mining and metals research consultants, in a new note points out that 16 contracts are set to expire this year. Escondida, with expected output of more than 1.2m tonnes, constitutes less than half production that could be effected. Of the 16 labour contracts, 10 are in Chile, five in Peru, and one in the US. Most of the contracts expiring this year cover Chile's state-owned Codelco operations (Andina, El Teniente, Caletones, Salvador, Ministro Hales and Gaby). Together, the Chilean mines and the Caletones smelter have a capacity of 3m tonnes per year or roughly 15% annual global output. "In some cases, there may be a question of causality, but certainly some of these strikes are the reason behind higher prices." Chilean labour laws have changed recently – in April 2017 – and the ramifications are not fully understood. Price is higher than during the previous negotiations. In an opportunity cost basis this can put more pressure on the company to reach an early solution. Higher prices are also an incentive for unions to dig in their heels and Union #1 at Escondida put down quite a marker in the third round of contract negotiations with part-owner and operator BHP. That works out to nearly $40,000 per worker (at 625 pesos per USD). 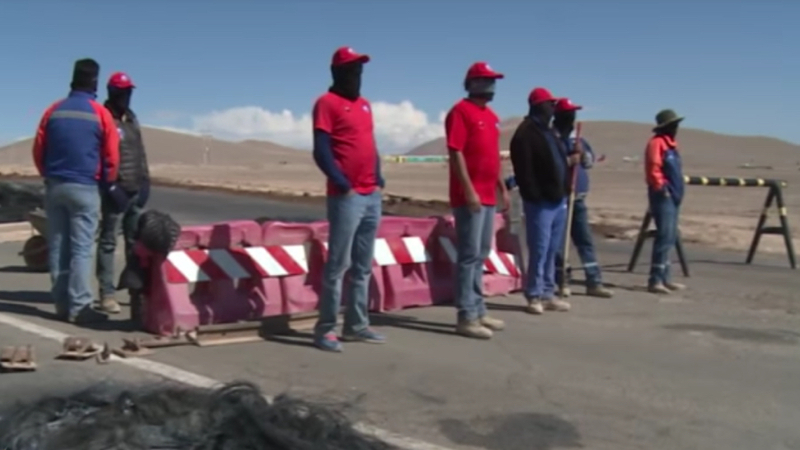 It would be the biggest bonus payout to mineworkers ever in Chile. Having said this, CRU believes that after a long and drawn-out period of negotiation, an agreement will be reached, and a strike will be avoided.